Health and happiness are fundamental to human quality of life. The United Nations World Happiness Report 2012 reflects a new worldwide call for governments to include happiness as a criterion to their policies. The Healthy Cities or Happy Cities movement has been endorsed by the WHO since 1986, and a Healthy House or Happy Home is a critical constituent of a healthy city or a happy city. Nevertheless, the concept has not been fully explored. Existing literature on the healthy house has often focused on the technical, economic, environmental, or biochemical aspects, while current scholarship on the happy home commonly centers on interior decoration. Few studies have addressed the importance of social and cultural factors that affect the health and happiness of the occupants. Identifying four key themes in Chinese philosophy to promote health and happiness at home, this book links architecture with Chinese philosophy, social sciences, and the humanities, and in doing so, argues that Architectural Multiculturalism is a vital ideology to guide housing design in North America. 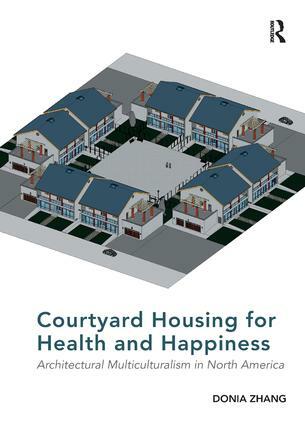 Using both qualitative and quantitative evidence gathered from ethnic Chinese and non-Chinese living in the USA and Canada, the study proposes that the Courtyard is a central component to promote social and cultural health and happiness of residents. It further details courtyard garden house design strategies that combine a sense of privacy with a feeling of community as represented in courtyard housing. The schemes may have universal implications. Foreword, Richard Harris; Preface; Introduction: health and happiness in housing; Four key themes in Chinese philosophy to promote health and happiness at home; Health as balancing Yin Yang: form and environmental quality of the housing; Health as gathering qi: space and construction quality of the housing; Happiness as attaining oneness: matters of social cohesion in the homes; Happiness as knowing the Dao: time and cultural activities in the homes; Four keystones of courtyard housing design; Conclusion: courtyard housing for health and happiness; Appendix; Bibliography; Index. Dr Donia Zhang is a graduate of Oxford Brookes University (BArch, MA, PhD) in the UK and Brock University (MEd) in Canada.